Kim Stanley Robinson's new novel comes out in barely a few days - RED MOON will be available from Orbit USA & UK in hardback, ebook and audiobook from October 23! But first I wanted to showcase two examples of a vibrant community-building readership of Robinson's novels! "Marooned on Mars with Matt and Hilary" is an on-going podcast that looks at each chapter of the Mars trilogy in detail! They are more than mid-way through Green Mars, and it's great to see these twenty year old books get the podcast treatment. In their latest podcast, Matt and Hilary meet Stan himself around a nice dinner! You can also support them with a small donation. Through the past summer, Bryan Alexander animated a book club around New York 2140, where they looked at each individual part! This generated a lot of discussion and a plethora of links and further reading suggestions, do check it out. More of these initiatives are sure to pop up in the future and we we are certainly going to cover them here! As part of The Guardian's "Overstretched Cities" feature, Stan wrote a polemic article: "Empty half the Earth of its humans. It's the only way to save the planet". Taking inspiration from EO Wilson's book, Half Earth. This vision is one possible format for our survival on this planet. They will have to be green cities, sure. We will have to have decarbonised transport and energy production, white roofs, gardens in every empty lot, full-capture recycling, and all the rest of the technologies of sustainability we are already developing. That includes technologies we call law and justice – the system software, so to speak. Yes, justice: robust women’s rights stabilise families and population. Income adequacy and progressive taxation keep the poorest and richest from damaging the biosphere in the ways that extreme poverty or wealth do. Peace, justice, equality and the rule of law are all necessary survival strategies. All this can be done. All this needs to be done if we are to make it through the emergency centuries we face and create a civilised permaculture, something we can pass along to the future generations as a good home. There is no alternative way; there is no planet B. We have only this planet, and have to fit our species into the energy flows of its biosphere. That’s our project now. That’s the meaning of life, in case you were looking for a meaning. Elon Musk mentioned that having a reserve population in outer space—on the moon or on Mars—could be helpful in case World War III devastates humanity. Is this a viable solution? Or might the rich leave for space while the rest of us suffer? Billionaires moving to space is not just similar to a sci-fi plot—it is a sci-fi plot, and not very realistic. It has to be said: There is no Planet B. It’s here for us, or nowhere. But really, that is very obvious. Very few people actually believe that setting up a small settlement on Mars is an adequate safeguard or mitigation for the damage we are doing here on Earth. Those who do are fooling themselves. What does post-capitalist space exploration look like? It looks like NASA. It’s government, exploring a commons of sorts, doing it in the usual “of the people, by the people and for the people” way. Speaking of space exploration, Aurora got an unexpected increase in fame coming from a space/sci-fi-friendly reader: Tom Hanks, who tweeted about it to his large audience! "What a Saga! 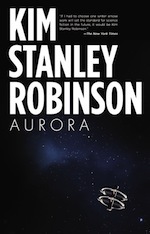 SciFi with honest, complex Humanity, Physics, biology, sociology. Never had the feeling I experienced on page 321. K. S. Robinson, you rocked our “world”... Hanx" Stan reacted for Sactown: "It was a total surprise. I once heard a rumor that he liked the Mars books. It was definitely a fun thing to see." In this case, I told my editor Tim Holman that I wanted to write about global finance, and he suggested that to write a novel about something so abstract I should set it in a tangible place, and he reminded me of the drowned New York that appears briefly in 2312, and pointed out that a novel about finance could sensibly be set in New York, a world center of finance capitalism. Then he also suggested the apartment novel format as a way of portraying all kinds of lives in this drowned city. There's no better insight into Stan's daily life than to get him to talk about gardening and preparing meals! In this article for Plymouth University's Imagining Alternatives, he explains why "Enough is as good as a feast"
I’ve lived in a small alternative community for the past twenty-seven years. […] Organic gardening space is available to all who want it, and the landscaping is mostly edible in the form of fruit and nut trees. […] Taken all in all, it’s not paradise or utopia or the housing solution to the world’s ills, but it is nice, and for me it has proved the idea that urban design influences social reality, and that infrastructure helps to determine social and human relations. […] the loosely vegetarian orientation of our Village Homes potlucks felt good, for the reasons cited above, both environmental and animal-moral. The variety of cooking styles at each meal was huge and made the absence of meat barely noticeable—really the meals were a treat for the senses. […] We were social primates doing a social primate thing. “[WALL-E] begins to make all kinds of mature adult decisions. He falls in love, does radical things, joins a revolution and overthrows the social order that already exists,” Robinson said. Prose and music! "A Forest Unfolding" was a musical project in New Hampshire. "Novelist Richard Powers presides over a collaborative effort involving four composers, four writers, and an ensemble of instrumentalists and singers. […] Four writers—the environmentalists Bill McKibben and Joan Maloof, along with the novelists Richard Powers and Kim Stanley Robinson—selected prose passages and poems on the relations among people and trees. They presented these selections to four composers—Eric Moe, Melinda Wagner, Stephen Jaffe, and David Kirkland Garner—who set these words into a linked sequence of recitatives and arias. The resulting whole traces a narrative arc from human estrangement from nature to a glimpse of the endless cooperation that knits a forest together." Stan was the judge of the second edition of "Everything Change Climate Fiction Contest" of short stories for Arizona State University's Imagination and Climate Futures Initiative! Top winners will be published in a free digital anthology in fall 2018. Stan will be participating in an architecture-meets-science-fiction master's program at UC Berkeley: "UC Berkeley architecture professor Nicholas de Monchaux and BLDGBLOG author Geoff Manaugh will teach a special, one-year graduate course, titled “Studio ONE,” focused on the intersection of architecture and science fiction." 2312 has been translated in Turkish, and its translator talks at length of all the issues with dealing with a novel that has such a varied and specialized vocabulary! Blue Mars's translation in Japanese was nominated for the 2018 Seiun Award for best translated novel. We will be back soon with news around Red Moon!